Popular Science Blog - A Risk to National Security? A Risk to National Security? "The need for such secrecy is simple: It is essential to preserving technological surprise. The Pentagon wishes to prevent enemies from developing strategies to counter the technology. The challenge is to figure out what precisely is happening—without betraying national security—because the bigger the black world gets, the better it conceals its activities." But if the programs themselves are shrouded in absolute secrecy, does intelligent speculation by a veteran analyst itself represent a risk to national security? Sweetman himself points out that his investigation is "inescapably an educated guess," but what if he's managed to guess more or less correctly? Take a look at the article and let us know what you think in the comments section below. Very interesting piece. I have wondered what had been developed as a F-117 surrogate fighter/Bomber and I was thinking aobut a two seat stealth attack fighter with the carriage capability of 4 2000 lb JDAM type Laser guided bombs and a longer range than the stock F-117. If they built the A-12, it probably was the Boeing Phantom Works site in St Louis with components airlifted to Tonopah by nightly C-17 flights for final assembly. In designing classified aircraft, you will always be prototyping on a constant basis. That means a limited run production of 4 airframes each contract to allow for attrition in an aggressive test program. To further enhance creativity, you must continue to fund and create black aircraft and see what you have devised before making a decision on further limited production runs aimed at squadron strength like it was done on the F-117 program in the 1980's. Whether or not they built an operational squadron is up for grabs as the only place it could be based is in the 72 shelters at Tonopah made available when F-117's were relocated to Holloman AFB. You could not base an A-12 on a USN Nimitz class carrier as you would be "outing" the plane from the black world. It would be nice to see the crations of the black world as it helps validate the worth of the billions of dollars spent on faith in the programs. It takes a lot for someone to tell a Congressman that he or she cannot divulge the reason for the spending request on a classified program and to trust them that they are doing the right thing and not wasting the money. A succesful black program cannot be judged soley on wasted money as that is often chalked to a learning experience. The only way we can learn is to make the mistakes and spend the money to find the technology you want to have. We cannot penalize our children for taking the risks in academic programs as it is the only way they learn and develop their talents. Same for black budget operators. You know, all this stuff is interesting, but really, security comes first in my list of priorities, well, it comes ahead of speculation. If there's no security, there is no country or freedom to defend anymore. Secret programs are secret for a variety of reasons, some perhaps security related, and others perhaps political. But the fact is that most black ops programs have successfully kept the veil in place until conditions were ready for disclosure. I doubt that the main target of secrecy are curious onlookers and techie types who would love to be in on cutting edge science. Whatever speculation goes on in the press or between individuals, secrecy would have failed miserably if amateurs could so easily discern the truth. Don’t you think that every technologically advanced country in the world wants to know our secrets even more? Does anyone honestly think such countries don’t already know more than we gossipers could possibly guess with our peephole level of data? I think a “don’t look, don’t talk, and don’t think” mentality only fuels paranoia and probably enhances even more speculation. I am personally sick to death of tens of billions of our scarce tax dollars going down rabbit holes for which no one is accountable. That is a political secret worth busting wide open. Yes, it most definetly is a Risk to National Security! If we, the people, in a Nation is that is to be for the people, dont know, then, how can we be a Nation , being Secure? as a Nation of God, All of us, to be United in Unity through God, we have to know what is going on, and not to allow murder killings overseas, it is a very bad things to dehumanize ourselves by just sitting back and not even thinking or praying about it, pray for the people of the world to Unite, to extend out their hands, and put down their guns, we dont need guns, we need peace, everything comes thereafter! :-) Peace! One Love from God, Creator, Lover of Mankind! This is beyond irresposible! This type of reporting borderes on giving aid and comfort to the enemy. Shame on you. It is pathetic that htis is how you make your living; attempting to uncover secret military information that will only benefit those who wish to do us harm. Try doing something that benefits your country. Speculation is perfectly normal in a free, open society. The one caveat would be not to do as the New York Times and other publications have done, and reveal actual programs, projects or technologies that can tip off our enemies. 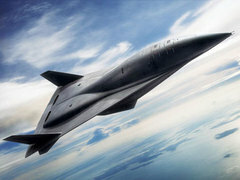 Other than Russians and Chinese, no other nation can hope to catch up with our last generation aircraft, much less the ever-evolving Aurora and other systems that are five generations ahead of what has been revealed so far. Speculation keeps everyone involved on their toes; our potential future adversaries probably speculate even more. Don't forget -- some "leaks" are meant to point the bad guys down the wrong path! I only see it as a threat against national security when the people don’t know what there government is doing with our tax dollars. Sure the "enemy" can also read about our technology & capabilities but that’s better then only a hand full people or special groups knowing & having access to great power. The enemy isnt always on the other side of the ocean. Foreign & domestic enemies are everywhere and sometimes they even exist inside the government (some say they are the only real enemy again humanity). I want to know what my government, that represents me and my country so that they act accordingly and in the peoples best interests. Don’t forget, through-out human history of conflict, farmers with pitch forks with a better cause have always prevailed over any enemy dispite its advanced technologies... Good will always prevail over evil... I dont believe in a "God" but I do believe in good & evil. Information is free and secrets are shadows of deceit and pathways to evil acts. If you want peace, prepare for war but know what all sides are capable of. If our enemy has a weapon that can destroy us better then we can prevent them or be forced to destroy them, I want to know about it. Besides, there are no winners in war... there is no such thing as an enemy because we are all human beings. Its secrets and this mentality that one human is better then the other that’s preventing our species from advancing faster and improving our chances of survival... survival not just from "enemies" but from natural occurrences that have no emotions, they just annihilate. Asteroids, hurricanes, and the after effects of a burrito. The greatest risk according to Dwight Esinhower is the power and secrecy industrial/military complex. May I remind everyone that Boeing has antigravity technology that they have published. Now how does a aircraft engineering devise anitgravity??? I for one have no doubt that these vehicles that are presented in this article are no where near the actual capabilities of their true arsenal. I am firmly convinced that alien technology is in the hands of AREA 51 and is backengineered into the industrial complex as rightful patents. May I suggest the Disclosure Project of Dr. Green. If Boeing is releasing antigravity details to the public now, then they were doing antigravity in AREA 51 quite a long time ago. Like Esinhower stated the biggest threat to the Constitution is the industrial/military complex. 911 and national security are a deteriation of personal freedom and civil rights and liberties. The greatest risk according to Dwight Esinhower is the power and secrecy of the industrial/military complex. Now how does a aircraft engineering devise anitgravity? I am firmly convinced that alien technology is in the hands of AREA 51 and is back engineered into the industrial complex as rightful patents. May I suggest a full reading of the Disclosure Project of Dr. Green. Unfortunately 911 and national security have caused a deteriation of personal freedom and civil rights and liberties. This story in no way damages National Security. This is the "boring" stuff. If we strip away speculation on the future, we will not have any future. The consequences for scare tactics of giving up freedom for safety was well considered by Benjamin Franklin. A culture of secrecy can be a greater risk to a republic than openness, as totalitarian states show. The American public knew far more about the Soviet bloc than any Soviet citizen, and yet the Soviet could be jailed for trivial things in the name of "state security". Hypersonic planes and far more advanced things have been known for years by people the mainstream publications laughed at, but anyone interested in spying on them wasn't getting it from magazines anyway. The far greater threat is the one from within--how effectively a public can be manipulated through the use of fear (the real terrorism) in the disguise of security. Technology is a tool, but it is only part of a part of a part of security. If so called hostile interests are ahead of the traditional game, the public, the government's boss and not its subjects, should be too. Well said chris, the US government is currently engaged in the largest and most successful propaganda campaign ever. Its in its interest to keep the American public scared (notice how terror alert levels will never go to zero) because that way it can justify pretty much anything by inserting the buzz words "evil, terrorism, wmd's" etc etc. It appears that the American public is waking up to this a bit though. And credible people are speaking out about nearly every step on the way. EG: Weapons inspectors in Iraq resigning and saying it was quite obvious there were no wmd's; US military lawyers speaking out against the trail system in Guantanomo bay, claiming its unfair and is only designed to get convictions. It pains me that America insists on a "war" against terror, when some simple foreign policy changes could eliminate MOST of the aggression towards America. What the American public must realise and accept is that thier standard of living is much much higher (as an average) than that of the third world, and that is a DIRECT result of the third world being disgustingly empoverished. Essentialy the American public may aswell be using them as slave labour, although its wrapped up and well concealed with tricky economics and sanctions it is essentially whats happening. Think about it like this: People in the third world are dying of starvation in thier millions, while it is predicted that Americas next major health problem will be OBESITY, how do you think that would make them feel. Perhaps if things like this were to change there would not be so much aggression towards the US, dont buy the "jealous of our freedoms etc etc" they are people too, they just want a fair go. Wasn't this the same publication that presented an article about how the author "drove right to the heart of Area 51 and found it deserted"? There will always be black projects, and they ARE essential. I personally don't want "enemies" knowing about what our capabilities will be in 5, 10 or 20 years time! IF YOU THINK "SPECULATION" OF SECRET MILITARY PROJECTS IS A NATIONAL SECURITY RISK, THEN YOU ARE FOOLING YOURSELF. OTHER COUNTRIES ARE DOING THIS SAME THING RIGHT NOW. THEY HAVE BETTER PEOPLE SPECULATING ON HINGS LIKE THIS AS WE SPEAK. THEY HAVE SPIES DIGGING THROUGH PAPERWORK AND COMPUTER FILES TRYING TO HACK INTO GOVERNMENT COMPUTERS. UFO-CONSPIRACY THEORISTS ARE DOING THE SAME THING EVERY DAY AND EVERYBODY LOOKS AT THEM AS IF THEY ARE IDIOTS. YOU MIGHT AS WELL INCLUDE THE POPULAR SCI-FI CHANNELS AND SHOWS THAT DEAL WITH FUTURISTIC IDEAS AS BEING A NATIONAL SECURITY RISK AS WELL. I'm far more concerned about the stories run by local newscasts that show people sneaking contraband through airport security than a bunch of conjecture about futuristic development. Our most dangerous enemies aren't going to be stealing plans for vertical takeoff supersonic jets. They're smuggling explosives disguised as mouthwash on to commercial plans. Those who would harm the United States include people with aerospace engineering degrees and Internet connections. They have already figured this stuff out and to assume otherwise is stupid. Go and look at pre-war caricatures of short-sighted, weedy Japanese fighter pilots and think about Pearl Harbour. And by the way - it wasn't us that reported that Area 51 was closed! Does anyone wonder if the "Flying Triangles" that were seen over Phoenix, AZ were any part of this? To me the question of What are the flying triangles? is the most fascinating question that I would love to know the answer to. Does anyone know? What are some good websites about the triangles? Try http://en.wikipedia.org/wiki/Black_triangles for a start. But even potentially hostile states already know more than mainstream western scientists because they're more open to the technology of the unconventional; saucer craft, which I have seen, and paranormal phenomena included. I believe in security, but I still look suspiciously at Clinton and Bush's gross technology laxities and wonder. I also worry more about whether we are mentally advanced enough both to skilfully negotiate the political realm in coming years and to preserve the country as an intact real democracy worth employing technology to defend. And one PS for paradox, Bill: you're very right about not underestimating potential adversaries, but every credible witness account, of which there are many, and a truckload of documentary evidence indicate that FDR's foreknowledge of and interest in Pearl Harbor is a lot more than dismissable conspiracy theory. I share the feeling that articles such as this one are nothing more than entertainment for the curious minds of those interested in aerospace development. I do not think that we as Americans are priviledged with any additional information not already to anyone we might consider a theat to this country. Its nothing but harmless speculation. A far cry from Heraldo drawing lines in the sand. Does anyone think that the pros of advanced espionage nations like Israel, China, etc. are not way ahead of any speculation on your part. You guys are amateur in comparison.